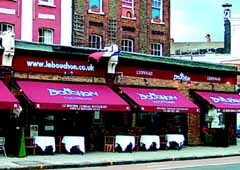 This elegant Battersea Brasserie, opened in 1987, features large linen covered tables and picture windows surrounded by the modern art paintings of Pascal magis providing an elegant but warm location for a typically French evening. Its adjacent bar with its deep sofas offers an excellent alternative for a pre or after dinner drink. Open every day from 12 noon to 11pm. Our Head Chefs at both the Bordelais and the Lyonnais are always happy to meet customers to discuss party menus. Some of our produce comes directly from France.